Tony Award-winning Ensemble Member Mary Zimmerman returns to the Water Tower Water Works, following the successful run and three city tour of Argonautika, with her Lookingglass Original adaptation of one of the world's most enduring works of literature. When he discovers his wife in the arms of another man, King Shahrayar vows to ruthlessly murder every virgin in the kingdom. His brutality is interrupted only when he encounters the cunning maiden Scheherezade, whose captivating stories may just save her life. This boldly re-imagined visual feast celebrates the redemptive power of story telling. "...I think the brilliance of this piece, which is Zimmerman�s most theatrically complete and perfect creation, can be seen in that first moment, when Louise Lamson�s bright-eyed Scheherezade starts spinning her life-preserving stories for Shahryar, now played by Ryan Artzburger, an actor who somehow simultaneously capures a brutal core, a sad heart and a vulnerable soul. Scheherezade�s scared little sister, movingly played by Heidi Stillman, looks on, willing the stories to overcome violence." 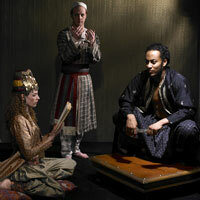 "...The exuberant and sensual (if a bit overlong) revival of the show that opened Saturday at Lookingglass plays more beautifully, passionately and humorously than ever -- from the thrilling prologue, with its explosion of drumming, swiftly unfurled Persian carpets, glittering lamps and harem dancers, to its finale of exhausted storytellers rolling in tandem as they fitfully sleep and dream. And it possesses all the mystery, exoticism, energy and spiciness of a Silk Road bazaar of times past, even as its poetic meditation on things spiritual, on the psyche of despots, and on male-female tensions suggests enduring questions." "...If you missed Nights in 1992 or �97 or otherwise, the remount � featuring a core group of original cast members � is absolutely worth seeing. On third viewing, however, The Arabian Nights disapoints just a shade. At 2 hours and 30 minutes, the piece feels just a bit bloated: There�s a fart scene, for example, that while sure to provide endless snorts �n giggles to the scatologically inclined, seems to go on forever as the cast blasts, toots and blows great, wet spit raspberries on their arms for what felt to us like an entire lunar cycle. Color us snobbish if you will: We just don�t get the guffawing fascination so many people seem to have with certain bodily functions." "....Whether relating a prolonged fart joke or marvelous etchings of faith, loss, betrayal, and acceptance, Zimmerman finds the soulful truths that make up our enduring humanity, and does so with only the barest hints of polemic." "...The cast of Lookingglass regulars, along with several auspicious newcomers, deliver performances encapsulating the essence of ensemble playing not an inch of the stage picture is ever allowed to lapse into stasis, wherever the principal focus may lie. Lucky Chicago playgoers may recall many of this company's projects in their fledgling state, but our reward with this revival is to revisit the creativity that earned it international acclaim, honed and polished until it shines like Aladdin's magical lamp." "...Magic mirrors, the stories reflect the central plight�demanding humanity from a slowly relenting Shahryar. Scheherezade works like theater, turning us into children hungry for one more story before sleep. Mary Zimmerman�s once and future adaptation remains an inexhaustible classic." "...Zimmerman employs the full arsenal of theatrical tools�song, dance, music, and dialogue�in the service of the engrossing and often witty book. The staging even injects a bit of audience participation without breaking the once-upon-a-time spell of the narrative." "...And what an adventure it is. For over two hours, Zimmerman's adaptation of 1001 Arabian Nights delivers memorable stories featuring everything from highbrow life lessons to the longest fart joke since the Will Ferrell/John C. Reilly comedy "Step Brothers." There's singing, dancing and even a seemingly improvisational back-and-forth between two characters. "The Arabian Nights" is a show that grabs your imagination and doesn't let go. Even when the actors are managing stories within stories within stories, they do so with an effortless charm." "...Brilliantly acted out by a gifted ensemble that embodies playful storytelling, this proves to be one of Director Mary Zimmerman�s most entertaining productions. Void of the frequent dethatched academics found with some of her other erudite adaptations, The Arabian Nights connects on many levels and manages to combine gorgeous spectacle with captivating characters. Andre Pluess blends thrilling percussion and excellent choral work with his remarkable Composition and Sound Design to top off an outstanding design team in this exciting triumph." "...The Arabian Nights blends a varied palette of tones from its source. The first act emphasizes comedy: Riotous set pieces arise from the bawdy tale of �The Jester and His Wife.� After intermission, the play turns pensive, dominated by the moody story of Aziz and his drive to impersonate the great caliph Harun al-Rashid. Although the framing tale of Scheherezade suffers from relatively distanced performances by Lamson and Artzberger, the ensemble is exceptional." "...The 16 actors are amazing, many taking multiple parts, many in acrobatic roles, some playing musical instruments, all smoothly adjusting props � moving furniture, rolling and unrolling rugs � as they progress from scene to scene from market places, to throne rooms, bedrooms, harems, a madhouse and much more. In addition, there is the opportunity to let go when, at each performance, different performers improvise the story of the Wonderful Bag." "...At one point in "The Arabian Nights," King Shahryar declares that an endless catalogue of items could not possibly fit in a small bag. His queen Sheherezade counters with the wisdom that within our heads we do count all the magical wonders of the universe. You can be assured that within the mind of the visionary director Mary Zimmerman resides vast tales and unexplored journeys. Chicago theatre-goers can enjoy some of those visions in the current revival of Zimmerman's 1992 epic, currently completing the third and final stop of a three city tour at the place of its inception, Lookingglass Theatre Company." "...Zimmerman reminds us how much stories affect us. We tell and listen to them everyday, through text message or best-selling book. �Arabian Nights� reveals the tales of a culture that has a monumental effect on our daily lives and national policy, from mortar attacks to the cost of gasoline. Yes, gems of wisdom are found in the play, but most importantly, we find that our two cultures experience many of the same values and struggles."